After moving north from Taranaki in the mid-1990s, Julie Geange and husband, Neal, were set on finding a property that would enable them to combine their love of farming with a reliable income independent of the ups and downs of agriculture. Although they had never been to or even heard of Kai Iwi Lakes, they found this hidden treasure, situated on the Kauri Coast 31 kilometres north of Dargaville, impossible to resist. Operating a small accommodation business, particularly with young children, was a challenge, though worthwhile on several counts. “With guests coming and going all the time, our kids grew up having a new best friend every day. You can’t beat that for a lifestyle,” says Julie. When they first moved in, the property had a house, sheds and one cottage for accommodation. They set about increasing the options for visitors. “We immediately put on a second cottage for tourist accommodation then developed a budget unit. In 2000, we subdivided off three 4 hectare blocks. We wanted to give others the opportunity to live in the area, on land that wasn’t so well suited for grazing,” says Julie. Raising stock was their strongest interest. They built a calf-rearing shed and a small milking plant, milking to feed their growing calves. “We did plenty of calf rearing and still do. Yearly, we have raised up to 500 calves per annum and, on average, we have kept about 100 calves per year. We have also leased land, grazing cattle and pigs,” she says. They also built up a purebred Hereford herd. Operating the accommodation business alongside the farm worked well and, by 2005, having brought on various relocatable dwellings, they had five self-contained cottages, sleeping from two to 14 people. “We knew the cottages would always be a back-up, ensuring we had a steady income. We realised that people from Auckland were always going to come and stay at the lake, which meant the cottages would always tick over financially, regardless of what farming was doing,” says Julie. At 210 kilometres north of Auckland, and en route to Waipoua Forest and the Hokianga Harbour, it is an idyllic spot: a walk across the paddocks to rugged Ripiro, New Zealand’s longest beach, and within easy access of the peace, quiet and tranquillity of life on Northland’s west coast. 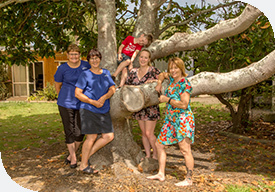 Twenty-two years later, having raised their three children, all now adults, and with Julie serving as a Kaipara District councillor since 2007, last year, they decided to move on. Having originally dealt with Wrightson Real Estate, when they bought the property in 1995, they engaged Megan Browing and Cindy Younger of PGG Wrightson real Estate, Dargaville to sell it. Megan explains how the sale went. “As there is always a relatively small market of buyers, selling an accommodation business can be a challenge. Fortunately, Julie and Neal had subdivided the property, giving interested parties the option of taking just one of the cottages as a holiday home or buying the whole business as a going concern. It was offered by deadline private treaty and we received multiple offers, including on the whole business, which is what they opted to go with,” says Megan. Like Julie and Neal, the new owners have also shifted north from Taranaki. While Neal will continue with livestock, keeping up development of the Hereford herd, Julie will push on with her interest in democracy and the policy-making process, looking back with fondness at Kai Iwi Lakes. “With all the memories of being there, I will certainly miss the location, the lakes and the proximity to the beach. It has been a fabulous place to live,” she says.